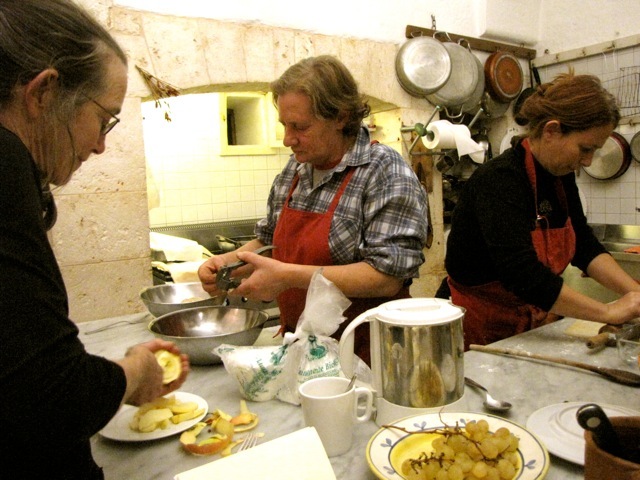 Gina and Jessica are the excellent cooks at Serra Gambetta. Gina is a potter and ran her own ceramics studio in the past. Her hands are even larger than mine, and she can make anything. Jessica is originally from France, but she has adopted Italy as her home and cooks with love and generosity. I was so excited to be welcomed into their kitchen–the original kitchen of the centuries-old farmhouse where Domenico’s family has turned the produce of their farm into wonderful meals for generations. In one corner of the kitchen is an open hearth where a small fire warms the room. Traditionally, beans were cooked in vase-like ceramic pots that were set just close enough to the fire to maintain a very low simmer (making perfectly-cooked beans). Another corner is filled with a mammoth commercial gas stove, capable of turning out food for many guests. The evening I helped in the kitchen, the menu included crepes filled with zucchini and fresh ricotta, fennel gratin, pasta with broccoli, a cheese plate, bread, and a salad of diced tomatoes dressed with olive oil and a sprinkling of salt and dried oregano. Gina braised the fennel while another guest hollowed out a loaf of whole wheat bread for breadcrumbs, Jessica made the zucchini filling, and I flipped crepes. This is a simple meal, totally dependent on the quality of the ingredients. The simplicity of the preparation allowed the vegetables to shine: essence of fennel, savory zucchini, tender broccoli, and bright flavorful tomatoes. 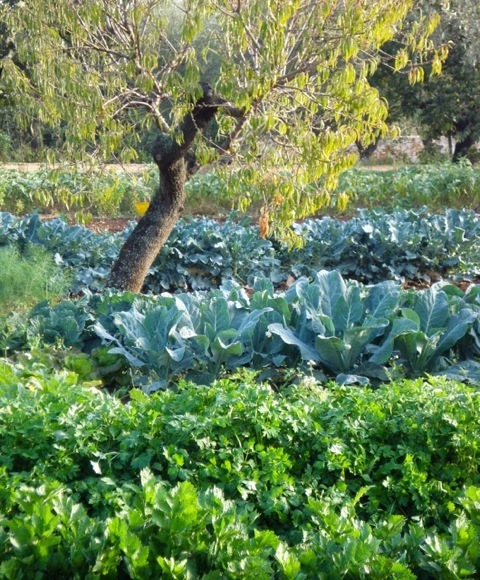 A vegetable lover’s heaven. Gina and Jessica cook like I do…a little pile of this, a big pile of that, a handful here, and a pinch there. There is no cookbook on the counter or measuring cups in sight. Measurements are approximate. Don’t hesitate to taste as you go, and make adjustments. Crepe batter (enough for 12 eight-inch crepes): Lightly beat 2 large eggs. Add 1 cup milk and 1/2 tsp. salt. Gently whisk in 1 cup unbleached all-purpose flour. Add one or two Tbs. water if needed to make a thin batter. Cover and let the batter rest for one hour. Filling: Grate 4 or 5 medium-small zucchini (enough to make 4 to 5 cups). Toss with 1/2 tsp kosher salt and set aside in a colander to drain for 1/2 hour. Press gently and squeeze dry in a clean kitchen towel. Heat 2 Tbs olive oil in a large skillet. Add the zucchini, tossing well to coat it with oil. Cook over medium high heat, stirring frequently for 4 to 5 minutes. Finely chopped garlic may be added if you like. Cook the garlic 1 minute, then remove from the heat and set aside to cool. When cooled, mix with 1 cup fresh whole milk ricotta and 1/4 cup freshly grated Parmesan or pecorino cheese. Taste the mixture and add salt to taste. Cook the crepes: Heat a crepe pan or other skillet with a small amount of oil or butter. Have a small bowl of oil handy to brush or wipe the pan as needed. When the pan is hot, pour in just enough batter to coat the bottom, rotating the pan as you pour to distribute the batter evenly. Cook the crepe 2 or 3 minutes, until the edge pulls away from the side of the pan and the bottom is golden brown. Flip the crepe and cook the other side about one minute. Brush or wipe the pan with oil and continue cooking the crepes, stacking them on a plate until you are finished. Add water or milk to the batter if it becomes too thick to pour easily. Assemble the crepes: Place a crepe on a plate and place a few spoonfuls of filling in the middle. Fold two sides in, then roll the crepe into a square. Place on a buttered baking pan, seam side down. Repeat until all the crepes and filling have been used. Place the pan in a pre-heated 400 degree F oven for about 10 minutes. Serve immediately. Note: I think you could make a delicious winter version substituting winter squash for the zucchini. I would add chopped fresh sage leaves to the mixture. Gina made her gratin with whole fennel bulbs cut in half. Put the fennel into a roasting pan coated with olive oil (use a sauté pan or skillet for fewer servings). Sprinkle the top of the bulbs with salt and chopped fresh parsley or dried oregano and drizzle with olive oil. Add 2/3-cup water (or enough to bring the water level to about 1/2 inch), cover the pan, and simmer about 30-35 minutes, until tender. If the liquid is not evaporated when the fennel is done, raise the heat and cook until the liquid is almost gone. Make the breadcrumbs: For 6 servings (3 fennel bulbs), mix 3/4 cup fresh bread crumbs with 3-4 Tbs Parmesan cheese, 1 Tbs. finely chopped fresh parsley, 1 minced garlic clove, and 2 Tbs olive oil. Spread the breadcrumbs on top of the fennel and bake in the oven, heated to 400 degrees F for 8 to 10 minutes. Variation: Slice 3 fennel bulbs about 1/2 inch thick. Arrange them in a single layer in a roasting pan or large skillet coated with olive oil. Sprinkle the slices with salt and chopped parsley or dried oregano, thinly sliced onion, and diced roasted red pepper or chopped sun-dried tomatoes. Drizzle with olive oil. Make two or three more layers until the fennel is used up. Pour 1/2 cup water into the pan, cover, and simmer 30 to 35 minutes, until the fennel is tender. Boil off any remaining liquid. Top the fennel with the breadcrumb mixture and bake in a 400 degree F oven to toast the breadcrumbs. Whole roasted onions are wonderful partners for grilled meat, chicken, or fish. We had them plated with grilled steak and served with a green salad at Serra Gambetta. I would make this just for the wonderful onion-balsamic pan juices. Believe me. Preheat the oven to 425 degrees F. You will need one medium-size red onion for each serving. Peel, and cut the ends off the onions. Parboil 3 minutes, drain. Transfer the onions to an oiled baking pan just large enough for them to fit closely. Sprinkle the onions with coarse kosher or sea salt, dried oregano or chopped fresh thyme leaves, and balsamic vinegar (2 tsp per onion). Drizzle with extra virgin olive oil. Add water to the pan, 1/4 inch deep. Cover tightly with a lid or foil and bake until the onions are tender, 45 minutes. Put the onions on a serving dish and spoon the pan juices over them. Louise, sounds delicious! Of course cooking this meal in a farmhouse in Italy sounds pretty delicious too. I’d like to have those three ladies in my kitchen all the time. You inspire me to make crepes again — there was a time I did it often. Today I’m going to see if I can get some fennel at Earthfare.